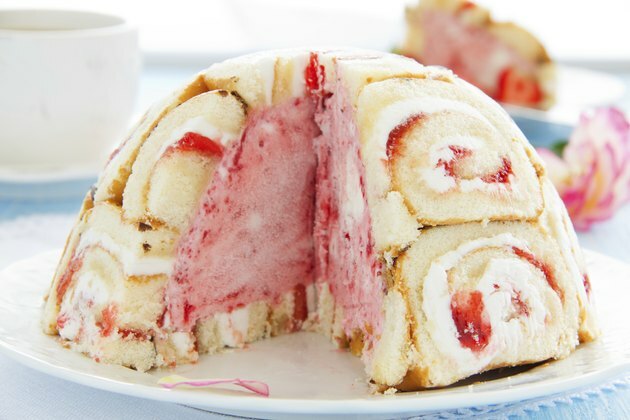 Ice cream cakes are made of layers of ice cream of different flavors, sometimes with baked cake layers or other ingredients mixed or layered in. Frosting choices for ice cream cakes are whipped topping, soft-serve ice cream or other topping that does not crack when frozen. As a frozen dessert, ice cream cakes can be made ahead of time. Thawing an ice cream cake before serving requires careful timing. Some ice cream flavors freeze harder than others. Chocolate, for instance, freezes harder than vanilla. Rum-flavored and caramel-flavored ice creams tend to remain soft in comparison to chocolate and vanilla. Some experimentation is necessary to determine the optimal thawing time for ice cream cake with combined ice cream flavors. Ice creams containing polysorbate 80 tend to keep its shape longer than ice creams without this ingredient. Thaw ice cream 8 to 10 minutes at room temperature before serving. While this is a basic rule of thumb for thawing ice cream cake at room temperature, the actual thawing time depends upon the types of ice cream and other ingredients in your cake as well as the temperature of your freezer. Refrigerator freezers should be kept at 0 degrees or lower, according to the United States Department of Agriculture. While countertop thawing is not recommended by the USDA for meats and vegetables, the danger of thawing ice cream at room temperature is the outside melting while the inside remains hard. Thawing your ice cream cake in the refrigerator is recommended. Carvel, one maker of commercially available ice cream cakes, recommends placing the cake in the refrigerator 30 minutes before serving. This recommendation is based upon the standard 40-degree temperature of your refrigerator. If you keep your refrigerator temperature colder than 40 degrees, allow additional thawing time. Garnish ice cream cake with fruit before serving, if desired. Do not place fruit garnish on your cake before freezing, as fruit takes longer to thaw than ice cream and will be crunchy when the cake is served. Other toppings, such as melted caramel or fudge can be added before serving for a softer texture. For clean, smooth ice cream cake slices, heat a knife in hot water and dry with a paper towel before cutting into the cake. Heat and dry the knife for each slice of cake.